Frazer Smart, who joined the team at fast-growing Aberdeen-based company Sentinel Marine after graduating, has also just returned from his first trip to sea. 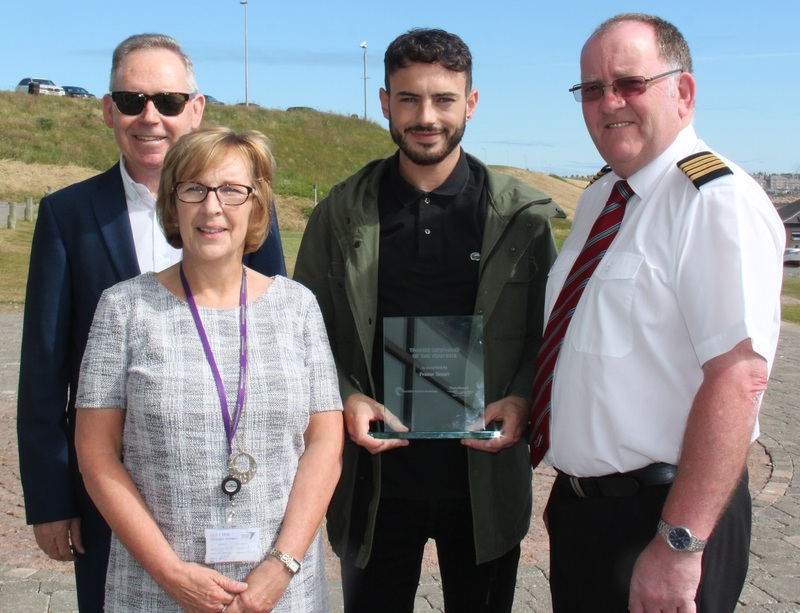 Frazer (24), from Turriff, was presented with the award, sponsored by Peterhead Port Authority, after lecturers on the 12-week programme determined that he was best overall student from the three courses that run over the course of the academic year. Sentinel Marine, which provides emergency rescue and response vessels (ERRVs) for the offshore industry, spotted Frazer’s talent when visiting the college to recruit new additions to its team. The firm is nearing completion on a £110m investment to add nine new-build state-of-the-art vessels to its fleet. Frazer spent his first trip at sea on board the Mariner Sentinel under the watchful eye of Master Mogens Karllson. The ship is currently operating within Statoil’s Mariner oilfield to the east of Shetland. Frazer says: “I joined the trainee deckhand course following several years within the engineering industry and a short stint as a joiner. I’d thought about a career at sea years ago and I heard about this course from guys who had been through it and managed to get good jobs afterwards. “You never know what it is really going to be like at sea until you’re out there, but I’ve really enjoyed it. I am part of a crew of 12 and I am using lots of the information that I learnt on the course on a daily basis. The trainee deckhand course covers a wide range of topics, including stability, vessel construction, communication and maritime safety. Sentinel Marine has the newest and most modern fleet of ERRVs in the industry, and by opting to build new rather than refit existing vessels, have ensured their ships are kitted out with the latest technologies and crew facilities. Unlike other ERRVs, the vessels can take on a wide variety of other roles in addition to the primary function of protecting the lives of offshore workers, including cargo storage, oil recovery and recue towing. Sentinel Marine senior crewing officer Natalie Fitzpatrick says that Frazer has a bright future ahead with the firm and has already had an excellent appraisal with very positive feedback following his first trip to sea.